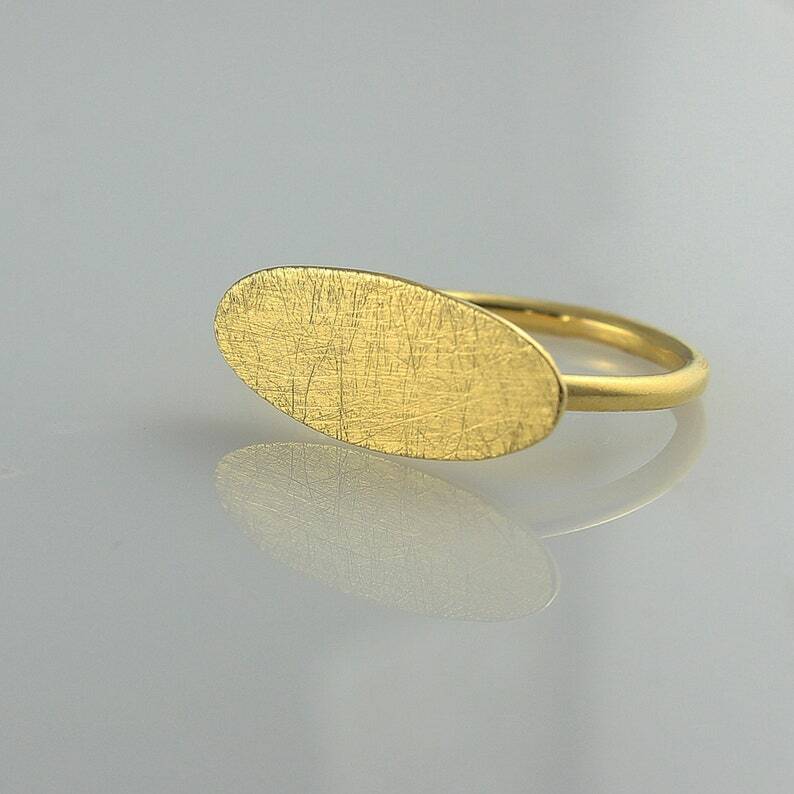 Solid yellow brushed gold oval signet ring for women. Minimalist 14k or 18k gold oval pinky ring. Super unique and minimalist gold oval signet ring for women. I absolutely love this beautiful ring! An original design, This ring is so special to me. The shape is a thin oval solid gold plate. It has a gorgeous brushed matte finish. Young and modern design that will fit everything in your closet - from daily wear to evening outfits. This ring has clean lines. it is delicate yet has an impressive presence. It will look absolutely gorgeous stacked with other rings in your current collection. Add this unique ring to your jewelry collection today! * 14k / 18k solid yellow recycled gold. * Ring thickness - 1.5 mm / 0.059". * Plate thickness - 0.5 mm / 0.02". * Plate length - 18 mm / 0.709"
* Plate width - 7.5 mm / 0.295". Please choose your preferable size from the drop down menu during checkout. ♦ The rings are custom made to order. Please allow up to 10-21 days to create it for you. * Take off your jewelry when coming in contact with – cleaning and chemical products, beauty products and perfume, pool and water in general. You will need a bowl with warm water, dish soap and a toothbrush. 1. Soak your jewelry in the bowl (with warm water & dish soap) for about 20-25 minutes. 2. Brush it gently with an old toothbrush. 3. Rinse it well with running water. 4. Dry it with a soft cloth. 5. Store it in a box so that it will not come in contact with other jewelry.